With this guide discover everything from cruising to Rving and more in this incredible ebook on travel. Stop worrying and get out there and go! 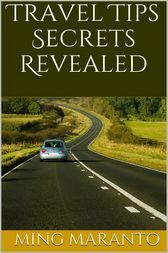 This book will get you from the planning stages to actually traveling in no time!With this ebook discover:- Why My Travel Tips Is Better Than Yours- Cracking The Travel Tips Secret- Travel Tips Tips that Guarantee Success- Travel Tips Flaws Exposed- And MoreGRAB A COPY TODAY!